Mt. 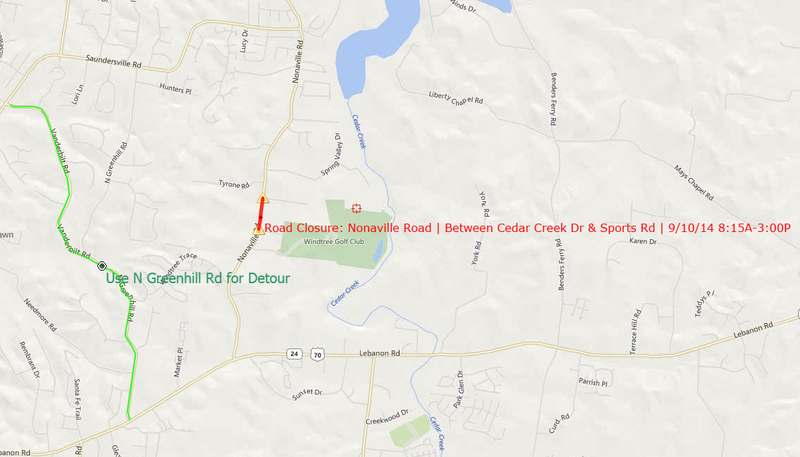 Juliet, Tenn. – A section of Nonaville Road will close on Wednesday, September 10, 2014 during the day. Mt. Juliet Police was notified by the Wilson County Road Commission that Nonaville Road will be closed between Cedar Creek Drive & Sports Road on Wednesday, September 10, 2014 from 8:15 a.m. – approx. 3:00 p.m. while crews complete an emergency repair on a pipe that runs under the roadway. During the closure, motorists can use N. Greenhill Road as a detour. This section of Nonaville Road is not in the city limits of Mt. Juliet; however, it is a main thoroughfare for many of Mt. Juliet’s residents.